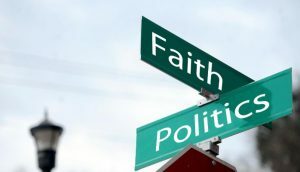 What Happens When Faith And Politics Mix? Join us for a lively evening as we discuss whether engaging faith and politics can be a positive thing, or whether it is an inherently volatile mix. 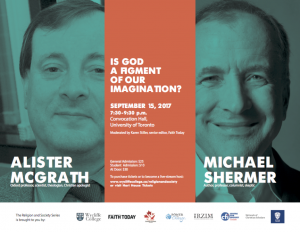 Dr. Andrew Biro, Professor of Politics at Acadia will join Dr. Anna Robbins, Professor of Theology, in this MacRae Centre event. The film 'An American Conscience' will be shown, a documentary highlighting the influence of theologian Reinhold Niebuhr on western politics. A critical dialogue will follow. 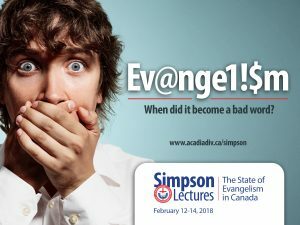 Evangelism: When did it become a bad word? 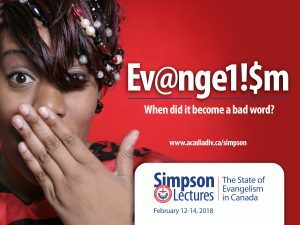 Simpson Lectures Join us in person or via livestream for evening lectures and afternoon events. There is also a prayer breakfast, chapel and lunch, and alumni dinner. See here for schedule and livestream details. Can you believe in both God and Science? Do these two realities conflict? "God & Science? 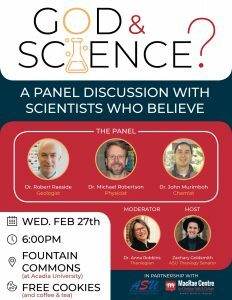 - A Panel Discussion With Scientists Who Believe" brings together three Acadia University scientists to discuss these questions.